• Total demand in China totalled 294t in the first quarter, a rise of 20% on the same quarter last year, as the economy continued to pick up from the downturn experienced in the second half of 2012. Bar and coin investment was 110t, rising by 22% from last year. • The Indian market also demonstrated a continued appetite for gold. 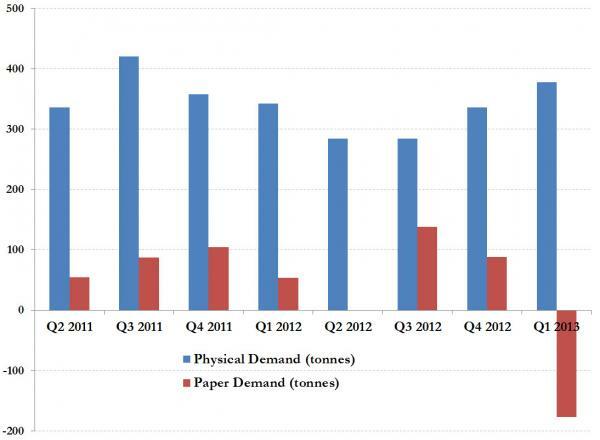 Total demand was 257t, up 27% on the same quarter last year. Retail investment was up 52% while jewellery was up 15% on Q1 last year. • Q1 2013 was the seventh consecutive quarter in which central banks acquired more than 100t of gold, and the ninth consecutive quarter in which central banks have been net purchasers as they diversify their portfolios. Central bank net purchases were 109t in Q1 2013, although the figure was 5% lower than the purchases a year ago. • ETFs saw a net outflow of 177t in the quarter. By contrast there were strong inflows into other forms of investment: bar and coin demand was 378t, 10% higher than last year. Bottom Line: In the face of the huge ‘paper’ gold ETF outflows, ‘physical’ gold demand surged to its highest in 18 months.